On Monday, the Republic of Korea (ROK)-United States Combined Forces Command (CFC) announced the dates for the annual ROK-U.S. military drills known as Key Resolve and Foal Eagle. According to a press release from the United States Forces Korea, the Key Resolve drills will take place from February 24 – March 6, and the Foal Eagle exercise will be held February 24 – April 18. 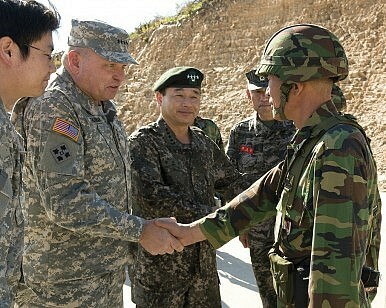 The annual military drills are described by military personnel as a key part of the U.S.-ROK alliance. CFC commander General Curtis M. Scaparrotti called Key Resolve a “vital exercise to strengthen readiness of the Republic of Korea and U.S. Alliance.” Foal Eagle is an ever larger exercise, which includes “CFC and USFK components spanning ground, air, naval, expeditionary, and special operations.” Key Resolve will involve 5,200 U.S. troops, while Foal Eagle will mobilize 7,500. Each year, prior to the joint exercises, North Korea (also known as the DPRK) urges the U.S. and South Korea not to hold the training drills. This year was no exception. North Korean news agency KCNA printed a statement from the Committee for the Peaceful Reunification of Korea that decried the “powder-reeking war exercises,” calling them “another serious military provocation against the DPRK and an outright challenge to the good faith of the DPRK.” The statement “sternly warn[ed] the U.S. and the South Korean authorities to stop the dangerous military exercises” and spoke of an “unimaginable holocaust” to follow should the drills proceed. North Korea’s Ambassador to China even took the unusual step of holding a press conference in Beijing, where he requested the cancellation of the Key Resolve and Foal Eagle drills. “We again propose immediately and unconditionally halting all military and hostile acts involving fellow countrymen [South Koreans] in collusion with outsiders [the United States],” Ambassador Ji Jae-Ryong said. Now that the dates for the annual military drills have officially been announced, North Korea is likely to retaliate. In fact, it may have already done so. Reuters cited an unnamed State Department official as saying that North Korea has revoked its invitation to a U.S. official to visit Pyongyang to negotiate the release of U.S. citizen Kenneth Bae. The State Department official clearly saw the move as retaliation for the joint military exercises. “We remind the DPRK that the U.S.-ROK military exercises are transparent, regularly scheduled, and defense-oriented. These exercises are in no way linked to Mr. Bae’s case,” the official said. Bae has reportedly been moved from a hospital back to a labor camp, despite concerns over his health. So far, however, North Korea has not issued an official response to the U.S.-South Korea military drills. Fiery rhetoric is to be expected, but a more severe response is also likely. One possible sign of North Korea’s wrath would be cancelling the scheduled family reunions, where families separated by the Korean War are to be allowed to meet for five days later this month. North Korea has already threatened to call off the reunions in response to the flight of a U.S. B-52 bomber off the west coast of the Korean peninsula. Given North Korea’s insistence on cancelling the military drills (which experts agree Pyongyang never thought was a likely outcome), signs of goodwill such as the family reunions may be the first casualty. In fact, it’s possible that the Kim regime only agreed to the reunions in the first place so that it would be able to cancel them, providing a real consequence to the U.S.-ROK drills. Of course, a more extreme response in the form of further missile or nuclear tests is also possible. The U.S. Director of National Intelligence recently confirmed that North Korea is continuing to expand its nuclear program. Other academic sources agree, including 38 North, the U.S.-Korea Institute at the Johns Hopkins School of Advanced International Studies, which believes a missile test is possible as early as this spring. If so, such a test might be framed a response to the provocation of the U.S.-South Korea military exercises.